In 10-inch skillet, cook sausage and beef until thoroughly cooked and no longer pink, stirring frequently; drain. Stir in remaining meat filling ingredients; cook 5 minutes, stirring occasionally, until thoroughly heated. Meanwhile, heat oven to 375°F. In small bowl, mix cheese filling ingredients. Unroll both cans of dough. Place dough rectangles side by side, on ungreased cookie sheet (if using crescent dough, firmly press edges and perforations to seal). Press to form 15x13-inch rectangle. 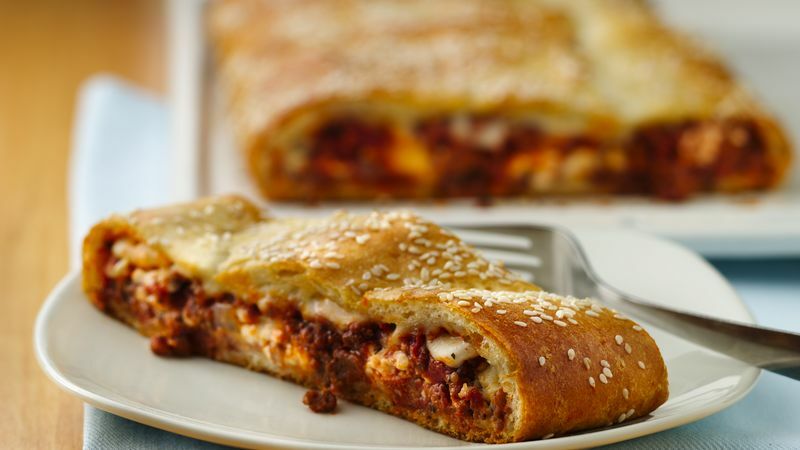 Spoon half of meat filling in 6-inch wide strip lengthwise down center of dough to within 1 inch of short sides. Spoon cheese filling over meat filling; spoon remaining meat filling evenly over cheese filling. Arrange mozzarella cheese slices over filling. Fold short sides of dough 1 inch over filling. Fold long sides of dough tightly over filling, overlapping edges in center 1/4 inch; firmly pinch center seam and ends to seal. Brush with milk; sprinkle with sesame seed. Bake 23 to 27 minutes or until deep golden brown.